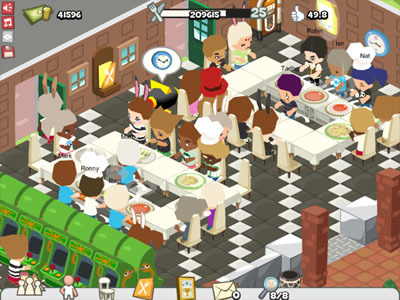 I’ve noticed there currently a lot of interest in Restaurant City (a Facebook game which I discussed earlier) so I’ve compiled my top five tips to successful restaurant management. All of this information (and much more) can be found by digging around the FAQ and the game’s forum, but these are the basics which will help you avoid frustration early on. 1. Make sure you have some friends playing. Your progress will be drastically slower if you don’t have at least a couple of Facebook friends registered and actively playing the game. Yes, it’s contrived to make you market the game for them, but hey, at least the game’s free. 2. Only spend money on necessities. Decorations can come later. Your primary objective is to earn cash and XP quickly. Most of the things that the game offers to sell you drain cash without giving any benefit to your earning ability. You need to unlearn the habits of other management games. Restaurant City isn’t as sophisticated as Theme Park, The Sims or Animal Crossing in this regard. There’s no “Feng Shui”. Most of the stuff you can buy doesn’t have any impact on how well your restaurant works or your customers’ wellbeing. The only things that you should worry about early on are the placement of tables, chairs and stoves and the stamina of your staff. 3. Learn how recipes and trading work – level up one dish first. The key to progressing quickly is to level up the dishes that you serve. There is no gameplay difference between any of the dishes. By all means, you can “catch ’em all” if you must, but you don’t “gotta” do that. (Ahem.) You will always receive $2 and 1 XP (a.k.a. ‘gourmet point’) for a level zero dish, regardless of the rarity of the ingredients. However, this doesn’t mean that it’s not shrewd to unlock a few dishes if you can. If you have three or four main course dishes unlocked that all require different ingredients, it becomes much more likely that you will be able to obtain the ingredients to level up at least one of these. Each time you level up a dish, you will gain an additional 0.2 XP each time that dish is served. For instance I currently have a Level 4 Spaghetti Carbonara, which nets 1.6 XP per serving. As you always have to serve one dish from each category (Starter, Main, Dessert, Drink), there’s no gameplay benefit in levelling up multiple dishes in the same category. It’s better to keep those ingredients in reserve for trading. 4. You only gain Experience (Gourmet Points) while viewing your restaurant. 5. Develop an efficient floorplan. There are lots of guides on the official forums covering the most efficient ways in which you can arrange your restaurant, so I won’t go into detail here. The penalties for an inefficient layout are quite lax, and you don’t need to worry about this much until the higher levels. The basic strategy is to minimise the distance that your waiters have to travel, and to ensure that you don’t have more tables than your staff can service (while at the same time having enough tables to ensure that people aren’t constantly being turned away). You should also be careful to ensure that customers have a clear path between the entrance and the seats, and waiters likewise have a clear path between the stove(s) and the chair/table units. Take a look at other players’ restaurants for ideas. Perform the following steps: Get friends to get ingredients to level up dishes. Furnish restaurant (frugally) to maximise rate of serving. Leave the game running in the background. Feed or rest all staff to 100% and save the game, and come back at least daily. Result: Profit! The only question remaining is why you’d want to expend so much time and effort on making a number get bigger, but I’m afraid I can’t help you with that one. Note: Playfish are continuing to add new features to the game, so some of the information above may go out of date in the coming weeks and months. Currently accurate – with the omission of micropayment features which are (as yet) not required to play the game effectively – as of December 2009. December 2009 update: The December 1st 2009 update to the game raises the level cap to at least 65(! ), and for the first time (that I’ve noticed) adds items (such as the Deep Sea Arcade machine) with limited gameplay effects which can only be purchased with Playfish Cash (i.e. real money). It is now also possible to buy outdoor expansions adjacent to your restaurant. May 2013 update: Restaurant City has now been shelved by Electronic Arts. Go and play Sims Social or Plants Vs. Zombies Adventures instead.